So I had a Friday booked off work and intended a 2 day jaunt to tackle the northern branch of Wainwright's Eastern fells. As is usual I watched the weather forecast intently over the preceding days and as is also usual I went anyway despite it looking fairly grim with lots of low cloud expected. I am always very envious of folk who can pick and choose the best days to head off to the fells but for me I have to book a week day off and then pray to the weather gods. I parked at Wanthwaite and headed off along the old coach road. After a short while a style appears over the dry stone wall on the right and a slightly obscure path meanders steeply up through the old quarry to emerge on the western flanks of Threlkeld Knotts. The summit of Threlkeld Knotts is well worth the short diversion from the main objective of Clough Head. There are fine views over to Blencathra and along the Keswick-Penrith valley. This is also a good vantage point to survey Clough Head which appears steep and impenetrable from this side but closer inspection reveals an indistinct path tracking diagonally upwards from left to right before emerging onto Bennesty Knott and the summit ridge. From the top of Bennesty Knott its a short walk along the ridge to the summit of Clough Head. By the time I got there the cloud had descended and visibility was poor. Unfortunately it stayed that way for the rest of the day. From Clough Head a good path leads south to Calfhow Pike before plodding steadily upwards to Great Dodd. I would imagine the panorama from here is excellent but I had use my imagination today. The path then continues to snake its way southwards taking in Watson's Dodd and Stybarrow Dodd. I then descended eastwards towards Hart Side and then Birkett Fell before looking for a suitable spot to make camp. By this time the wind had got up and I was thankful to find a dry stone wall on the east side of Birkett Fell which looked like a great wind break. It was only after following the wall downhill looking for a suitably flat area that I got back below the cloud level again. Initially the tent was sheltered from the wind but in the early hours it must have changed direction and increased in strength. The noise levels got up and despite ear plugs I got very little sleep afterwards. Next time I really must remember the Whiskey! The twitter chatter that evening suggested that there might be the chance of a cloud inversion the following morning and so it was with some excitement that I unzipped the tent door at 6am to see what awaited. Alas, no inversion but I could see the silhouette of surrounding fells and as the sky lightened I could see that the cloud base was well above the summits. Even Helvellyn was visible. The wind was still gusting strongly though despite being on the lee side of Birkett Fell. A change of plan was in order. 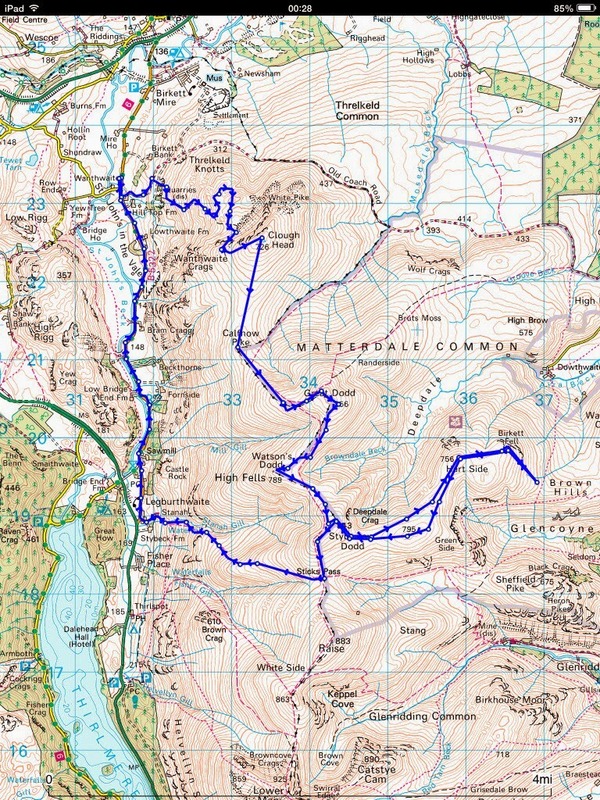 I had initially intended to walk along to Sheffield Pike and then return via Dowthwaitehead and the old coach road but feeling somewhat robbed of summit views yesterday I decided to retrace my steps to Great Dodd and then take a longer route back via Matterdale Common. By the time I walked back up to Birkett Fell summit it became evident that the wind was going to be a torment. I battled against a fierce headwind back up to Hart Side and then along to White Stones. By the time I got up to Stybarrow Dodd I was struggling to keep balance due to the constant buffeting. I therefore beat a hasty retreat down to Sticks Pass and descended to Legburthwaite before walking the last few miles along the road to the car at Wanthwaite. So a challenging 2 days in the fells. Following the all day clag on Friday at least I managed some good views from Stybarrow Dodd and a great sunrise on Saturday. Not many eastern fells left now and I reckon I can polish them off over 2 further day hikes which I will hopefully do before the end of the year. Food : Wayfayrer Tai Green Curry, Buttered Bread, Supernoodles,various sugary snacks. Clothes : Ron Hill wicking T-Shirt, Rab 100 wt fleece (250g), Montane Lightspeed windproof jacket (160g), Montane Prism 2 insulated jacket (423g), ME beany, TNF 'E Tip' gloves, sunglasses, Buff, Bridgedale socks & spare Sealskinz socks. Hard Shell = Mountain Equipment Firefox jacket (320g) and trousers (259g) not used. Trail Shoes : Meindl Respond GTX (820g pair) . Stand out pieces of kit (apart from the brilliant Scarp tent) were the Montane Prism 2 jacket which kept me warm and comfortable in the cold winds and also the TNF 'E Tip' gloves which won't win any awards for durability but kept my hands warm without having to continually take them off to use the touch screen phone. In the future, all gloves will be like this ! Litter in the fells. It drives us all mad and unfortunately, with the rising popularity of fell walking, seems to be a worsening problem. It seems that with increasing frequency I find myself coming back from a walk with the extra burden of having collected other folks litter. After tweeting about the issue recently and reading the responses I thought I would jot down some thoughts. Recent tweets after I posted this image of a sullied summit cairn on Little Dodd prompted a deluge of comments. In this example the contents of the bags were a dog owners property and as I was on day one a wild camping hike I really didn't want that particular delicacy in my rucksack for 2 days. Reluctantly therefore, I had to leave it. Its a shame that some dog owners do this. It seems strange to me that if you are going to the trouble of bagging it up then at least carry it down. Putting it in a bag and then leaving it seems to me to be a worse problem that just not bothering to pick it up in the first place. Its going to degrade much more slowly wrapped in a plastic bag, which itself is also a danger to wild life. "Scruffy peasants ..... what in the hell possesses them I'll never know"
"It's like they don't intend to come back & they do it everyday but not in their own houses, just outside"
"its an all to common sight. Lazy inconsiderate people leaving their c**p for someone else to pick up! Drives me mad"
"Grrr! these people aren't true outdoorists"
"Unfortunately we will never be able to stop littering but we can embarrass them to picking it up"
"It appears that even our wild places are not safe from the scruffy peasants"
"I frequently come off the fells with pouches full of rubbish ..."
"I carry a rubbish bag too. Usually pick up discarded drinks bottles"
I think the perpetrators fall distinctly into 2 types. On one hand there are the deliberate litter bugs. These are the type of folk who we all see throwing their flotsam out of car windows with no sense of a moral compass. I'm not sure if anything can be done about such people, they are likely beyond help. On the other hand though are the folk whose hearts are probably in the right place but are just ignorant of their actions. A classic example of this happened yesterday when descending Sticks Pass in the Lake District after a wild camping trip. From a distance down the path I saw a man and his wife fiddling with their packs and shedding gear as they were obviously warming up on the ascent. When I finally passed them the man said causally to me "By the way, if you want an orange I've left one by the stile down there. Its OK, its perfectly fresh". Weary after a sleepless night (that's my excuse for not being on the ball & challenging him) I just said "thanks" and continued down. Sure enough when I arrived at the stile there was a large orange on the ground right by the path. I looked back up but the couple were out of sight. Scratching my head it suddenly dawned on me that he was obviously trying to lose some pack weight and the orange must have been considered a heavy item. I can only imagine that he genuinely thought he would be helping a weary hiker by leaving it by the path, or maybe he just thought that because it's an orange it will eventually degrade so no harm done? I believe this second type of person is misguided but not beyond help. Perhaps by raising awareness we can all educate such folk. This was the largest item found this weekend. It's a burst balloon which probably blew into the fells. No malice here and its easy enough for me to take it home and bin it. Of course the vast majority of folk are respectful and courteous in the fells and I have seen many more examples of good behaviour than bad. Unfortunately the thoughtless minority can cause a disproportionate amount of heartache. One only has to look at pictures of Everest's south col to see what results from a lack of respect in the mountains. Closer to home, '3 peakers' make a considerable mess on Scafell Pike every summer necessitating an annual clean up by a team of local volunteers. Thanks for reading. Comments are welcome as always. This was an autumnal stroll with the family around Grasmere. No chat but some great photos. Grasmere was like glass and the light was superb in the late afternoon as the the sun set over Loughrigg.